Just under a year ago, startup Joule Biotechnologies announced it had engineered microbes that require only sunlight and CO2 to squirt out ethanol, diesel, or other hydrocarbons. On Tuesday, Joule revealed the details of that secretive microbe in the first patent for an organism that generates hydrocarbon fuel directly from sunlight. recombinant acyl ACP reductase (AAR) enzyme and a recombinant alkanal decarboxylative monooxygenase (ADM) enzyme.” That witches’ brew of cyanobacteria and enzymes allows for hydrocarbon production in a single step. 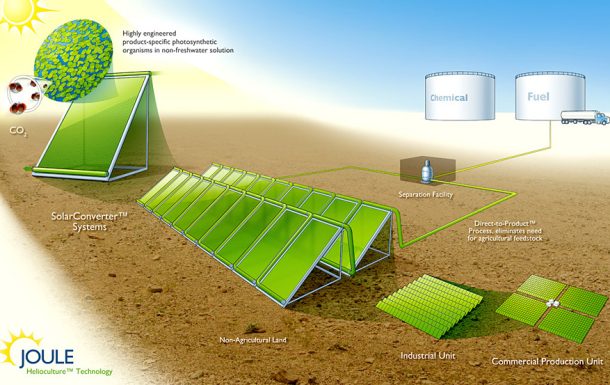 The organisms just capture sunlight to produce “Joule liquid energy”, a biofuel-like substance. Joule liquid energy can be an ethanol or diesel fuel replacement. Joule is currently testing out its diesel and ethanol production system in Leander, Texas. If all goes well, pilot production will begin by the end of the year, and commercial production will commence in 2012. And after that? Joule imagines that its fuels could act as a large-scale fossil fuel replacement, selling for as low as $30 a barrel. (Oil is currently somewhere north of $70 a barrel.) Of course, it remains to be seen if Joule’s bacteria can work fast enough to meet anything like the world’s insatiable energy needs.